California Winemakers Nervous About U.S.-China Trade Talks China is one of the top export destinations for U.S. wine, but last month, in retaliation for U.S. tariffs on steel and aluminum, China imposed a tariff on U.S. wine and other food. Trade talks are going on in Washington, D.C., between China and the U.S., in an effort to avert an all-out trade war. Among those closely watching are winemakers in California. 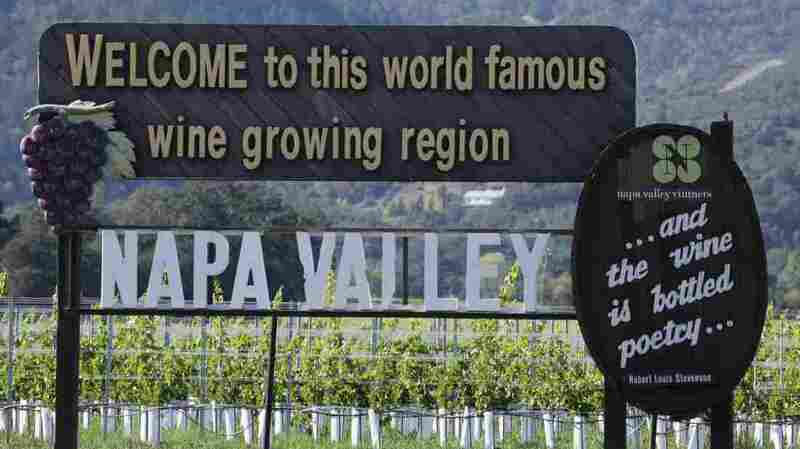 More visitors come to Napa Valley from China than any other foreign country, and some wineries actively court Chinese customers. Mondavi and Beringer host frequent Mandarin-language tours, and other wineries have menus in Chinese. At the tasting room at Honig Winery in Rutherford, Calif., there are Chinese signs, including ads for a door-to-door international delivery service. On a balcony overlooking his vineyard, Michael Honig points to row upon row of grapes that will eventually become sauvignon blanc and cabernet. Both are among the wines that his winery sends to China. In the past decade, U.S. wine exports to "greater" China, including Taiwan, rose 450 percent. But last month China slapped a tariff on U.S. wine, and other food and agricultural products, in retaliation for U.S. tariffs on steel and aluminum. China is now one of the top export destinations for U.S. wine, the vast majority of which comes from California. But, before the latest tariff spat, the combined taxes and tariffs for importing them to China were already more than 48 percent. On top of that, importers, distributors and retailers in China have to make a profit, too, and there are also shipping and warehousing costs. This already means a huge markup. "Our price point in the U.S. for our Napa cab, for example, it's roughly $50 on the shelf," Honig says. "In China, it's more than double. It's over $100 on the shelf in China." And now there's a 15 percent tariff increase. Most Chinese consumers haven't felt the sting of the new prices yet because stores there are still stocked with pre-tariff wine. Jeff Zhang, who runs a company called Napa Go, which markets U.S. wines in China, says the big wine-drinking season is around Chinese New Year. The spring is usually a good time to restock, but this year some importers are delaying their purchases. "Because of the tariff increase, there are a good amount of wine being put on hold in the inventory from the U.S., not shipping to China," Zhang says. Importers want to make sure there will be enough demand at the new prices. Honig winery had an annual shipment — worth hundreds of thousands of dollars — scheduled for this month. That's now on hold till the fall. Likewise, Wente Vineyards in Livermore, Calif., has $500,000 in wine shipments on hold. Chinese study-abroad student Kai Feng Chen was visiting a vineyard outside Calistoga recently. He said his friends who have traveled to Napa know how good the wine is and will likely continue to buy it. But if the tariffs boost the prices for people back home in China, that would make those wines popular. "If you have [a] $500 budget for wine, most Chinese I believe would choose French wine instead of American wine," Chen says. And French wines are not the only competition, Honig says. "If you look at other wines from around the world – New Zealand, Australia, Chile – they either have zero tariffs or going to zero tariffs next year, as it relates to China. We're going up. It doesn't make any sense," the winemaker says. "We're not gonna go out of business because we don't sell wine in China, but I think the bigger challenge is we're going the wrong direction." A few wineries have opted to temporarily take on the entire hit of the new tariffs themselves, fearing a lost market share now might take them years to build back. Other wineries are splitting the cost burden with importers. Later this month, winemakers from around the world will converge in Hong Kong for one of the largest wine shows of the year. Many California winemakers are hoping trade talks will be resolved by then, so they can continue to make inroads into this growing market.